“Until one has loved an animal, a part of one's soul remains unawakened,” wrote Anatole France. It is in this spirit that Joan Chittister has written a prayer to honor the presence of animals in our lives. 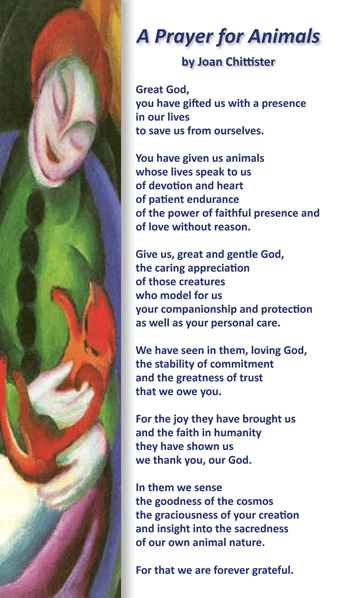 Use this as a personal prayer each day to honor the animals you love and to celebrate the joy they bring to so many. Make these prayer cards available at blessing services for animals, veterinarian offices, animal rescue shelters, and animal rights rallies. Send them to friends and family members who have recently welcomed a new pet or to those who have recently lost the pet they love. Full-color card is two-sided and measures 4" x 7"